2008 Supra Sunsport 22 V Serious air was never so much fun. Give every athlete in your family all the big air they want with the Sunsport 22V. Massive, tournament quality wakes of much bigger boats are part of the 22V package. With the agility of a champion, the maneuverability of the 22V at both high and low speeds is greatly enhanced by the deep drop V-keel and tracking fins. And when the water gets rough, the Drop-V keel allows the 22V to track straighter, ride softer and more comfortably, and to slice through chop more smoothly than virtually any boat in its class. The walk-through bow design provides everyone on board plenty of room along with easier passing through the cockpit. The unique sundeck stepway, hidden under the swim platform cushions, makes it easier to get in and out of the boat while eliminating the need to stand on upholstery. Two steps built-in to the back bench also help keep feet off vinyl and conceal a super deep cooler, plus an air compressor that will make quickwork of filling even the largest tubes. Versatile double-up and triple-up seating provides rear-facing seating that gives up to six spectators a perfect view of all the rider's high-flying action. And, like all Supras, the Sunsport 22V features interior vinyl with Nano technology for added stain resistance. So you're ready serious air? You're ready for the 22V. This Supra is loaded with options. 258 hours. 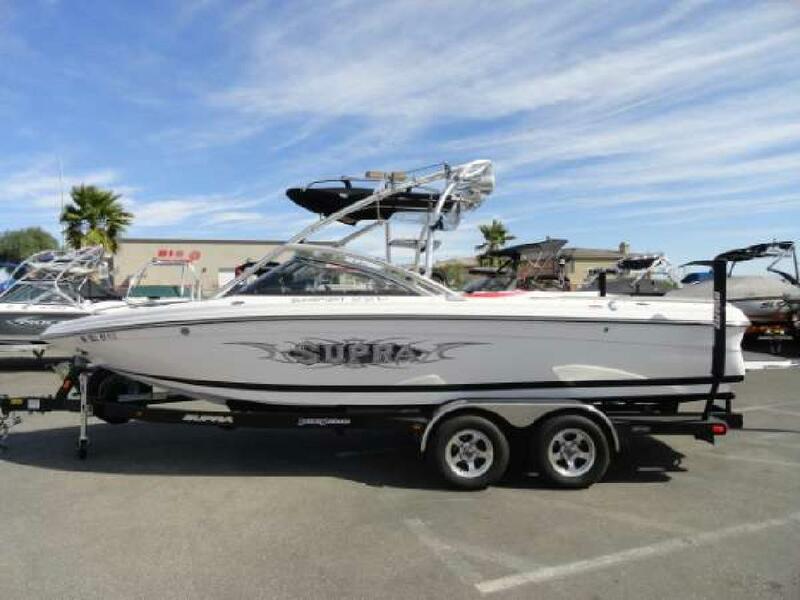 Featuring: Indmar 5.7L ETX CAT with 340 HP, wakeboard tower w/speakers and lights, board racks, bimini top, 3 ballasts, wake plate, heater, transom hot & cold shower, mirror, full instrumentation, Perfect Pass, depth finder, tilt steering, flip-up bolster driver's seat, Kenwood AM/FM CD Sirius ready stereo w/2 Kicker amps and sub, glove box, docking lights, carpet, cup holders, dual batteries w/switch, bow/cockpit covers, and a tandem axle trailer w/folding tongue, spare and LED lights.